Keep dogs and cats in a separate area without access to the main entrance/front door to avoid scaring trick-or-treaters or your pets. In addition, this will prevent your pets from possibly running outside while you least expect it. Do not bring dogs with you while trick-or-treating to avoid scaring other children walking around or the owners of the houses that you stop by. Keep outdoor cats indoors for a few day before Halloween to avoid potential problems with pranksters (especially black cats). 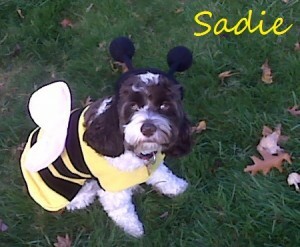 Any Halloween costumes for your pets should be loose-fitting and not have any small parts that may be ingested. Do not share any candy with your pets, especially chocolate, and be sure to instruct your children to do the same. Candy and especially chocolate can be lethal to pets because of its poisonous nature to them. Jack-O-Lanterns are dangerous if they contain lit candles inside, so be sure to pay extra attention to your pets’ location and proximity to them. ID tags or collars should be worn at all times in case your pet does escape from the house, so it can be properly identified and hopefully returned. Remember these tips while enjoying Halloween, and be sure to collect lots of goodies!